FJ HydroLite rain shirts for men are constructed from advanced technology-packed materials that deliver 100% waterproof, breathable protection for golfers in cool, windy and rainy conditions. 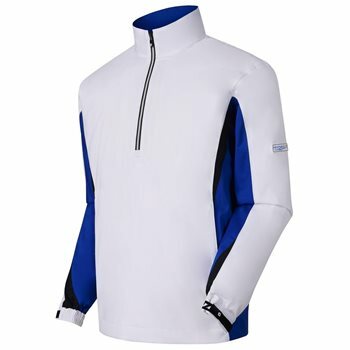 Make Every Day Playable with Tour-Proven FJ Outerwear and variety of golf clothes for men. FOUR-WAY STRETCH - This performance fabric offers extreme comfort and allows complete range of motion during the golf swing. HYDROLITE™ SYSTEM - The HydroLite™ System is a 100% waterproof shell. Combining lightweight fabrics with a bonded liner, makes this DryJoys piece the lightest garment ever produced by FJ. SCORECARD POCKET - A scorecard pocket makes for easy storage and retrieval. SEAM SEALED - Seam sealed for complete waterproofing.